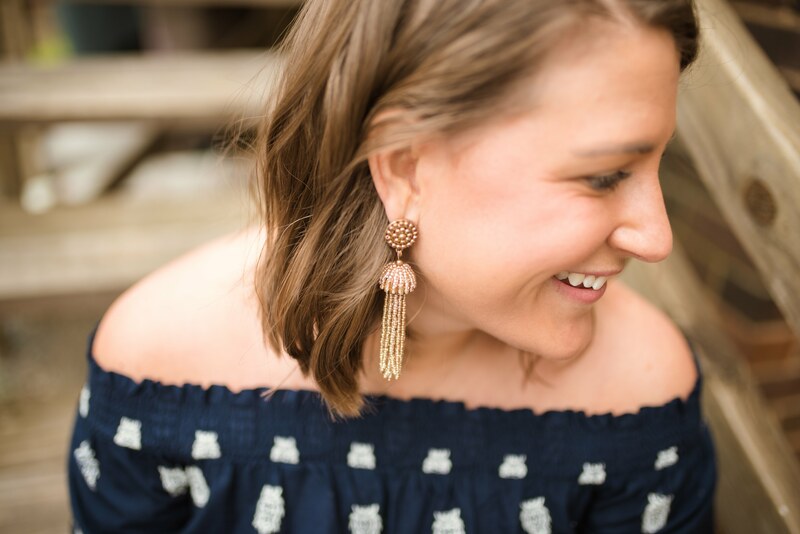 Today I’m giving y’all a round up of my favorite Spring staples. These pieces are all classics that can be worn many ways all season. These affordable options are all totally worth it and will make putting outfits together a breeze! 1. Jean Jacket: I have been loving my jean jacket lately. It’s the perfect way to dress down any outfit and it’s great for those days where it’s hot during the day and significantly cools down at night. 2. Basic White Tee: I found the best white tee from Old Navy and it has probably been my best purchase all year. You may remember this AWESOME shirt from last weeks post. You can find that here. A great white t shirt is a staple all year round, but especially in Spring when bright colors start to surface again. 3. Lavender Dress: this is the color of the year and it is absolutely perfect for spring weather. I especially love the floral print of this dress, it’s great for church, work, or a dinner date! 4. OTS Top: Off the shoulder tops have been trendy for the past few seasons and I absolutely LOVE it for spring. OTS tops are so flattering and come in so many different styles. I love this navy one with the tie sleeves. It’s a great length to wear with white jeans or shorts. 5. White Jeans: I wear white jeans nonstop after Easter (and sometimes even before 😉 ). This pair has been my go to for about 3 years now, but I found a very similar pair for you guys! You can’t go wrong with white jeans in whatever cut you prefer. They can pair so easily with a casual tee shirt or dressed up with a colorful top and wedges. I will be mixing and matching these pieces all spring and into summer! I hope this helps while thinking about outfits to wear this season. What trends are y’all most excited about right now? These pieces are all so cute! I need to get myself a nice denim jacket for spring because I love them and they’re so perfect for spring weather. I love your lavender dress, too! Thank you so much!! I have been living in my jean jacket! The one I have is from j crew and the quality is so great and they have been having awesome sales! Thanks so much! The jean jacket is so great! I love all of these pieces! And it would be so easy to mix and match them. I also love the budget friendly option 🙂 I think I need to go shopping!